One of Davenport’s more famous characters wasn’t an actual person. It was his personification of the Corporate Trust, a monopolistic financial construct designed to get around the Sherman Anti-Trust regulations. It seems fitting that Davenport would portray the “Trust Brute” as a person, since this was shortly after the U.S. Supreme Court’s initial ruling that declared corporations “people” with many of the same rights and privileges as those other people composed of flesh and blood. Far be it for me to correct the artist, but Homer was mistaken. I searched far and wide for any reference to a Sampson statue in Venice, and came up empty. I even asked several folks who were visiting to keep an eye out for him. Nothing. 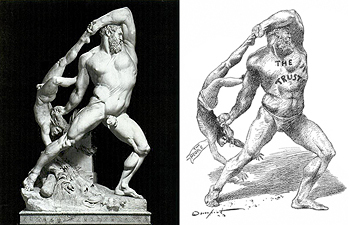 But the more I looked at Davenport’s cartoon, the more the big dude reminded me of Hercules, (as I recall my mythology, Sampson was known for his long hair). So I shifted my search and found this interesting statue, (above left). Not in Venice, but rather Rome. “Hercules and Lichas” is the name of the original piece and it was carved between 1795 and 1796 by Antonio Canova (self-portrait, left – 1757-1822) who was from Venice. In Greek mythology, Lichas was Hercules’ servant, who brought a poisoned shirt from Hercules’ wife Deianira because of her jealousy, eventually killing him. While in pain, Hercules asked Lichas who gave him the robe, after which he flung him over a cliff into the ocean. After this initial representation, Davenport modified the Brute, giving him a grass kilt, low forehead and big bushy beard, (right). 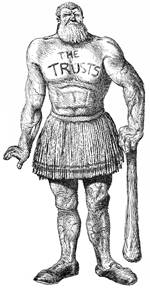 The “Trust of the Day” was emblazoned across the Brute’s chest. Sometimes its the Standard Oil Trust. Other times its the Coal Trust. And sometimes multiple Brutes were shown together to signify out-of-control corporate greed.